This entry was posted on July 14, 2012 by Robyn Lee. It was filed under Pain Shadow Series, Self Portrait, Summer 2012 and was tagged with castles, challenge, choice, Cinderella, control, dawn, Disney, dreams, emotion, fairy tales, faith, focus, happiness, healing, health, hope, Julie Catherine, Love, meditation, ocean, peace, photography, poetry, sand castles, shadow, soul, spirit, trust, wisdom, wishes. 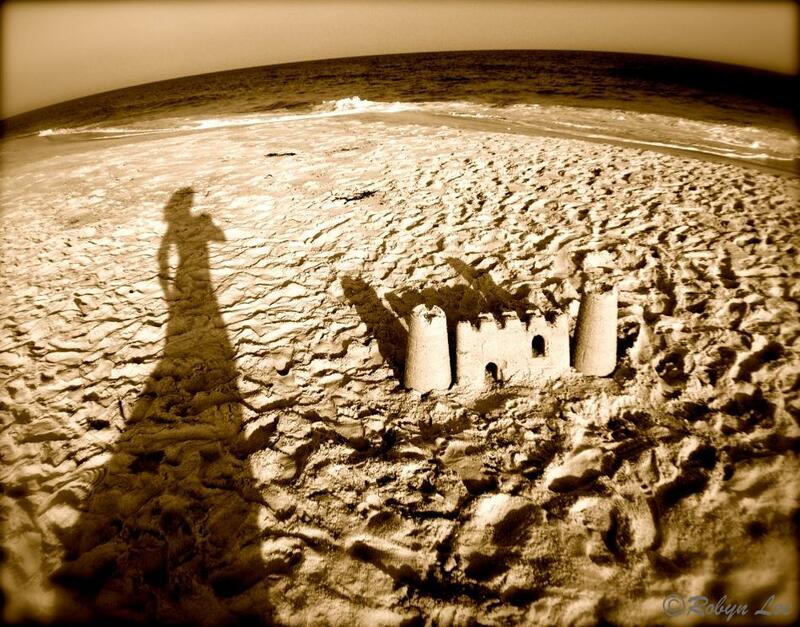 Very creative with the morning shadow and the sand castle under construction. A real fairytale. Thank you Kim! I also thought so much a fairytale shot — took it a few weeks back, felt now a good time to indulge. Thrilled you enjoyed! Thank you soooo much Sam. Yes – Julie’s poetry/writing is brilliant -know you will enjoy it. Beautiful captivating photography, lovely words. Great combination Robyn. Thanks Meryl…. yes I agree, the collaborations have been wonderful. This one was completely unplanned, as Julie was my first comment and made mention of her poem, which I then read and adored ~ and thus here we are. Love when things unfold like magic that way. Her blog is filled with fantastic writing ~ you might enjoy her style a lot – highly recommend. Oh my goodness!! How you have captured the magic of the princess-fairytale-archetype in your gorgeous photo. So beautiful. Wonderful, wonderful photo Robyn. Your shadow images get better & better every day. I have always felt Cinderella was such a delightful name and wanted to so name my daughter. But she was named Cristina instead. some of the most memorable movies i have ever seen were produced by Walt Disney Studios …. and some of the most memorable posts i have ever read have been produced by you Robyn, so there seems to be some kind of correlation here and that correlation seems to be …. legendary. What a lovely picture! I love seeing through your eyes with the things you capture through your heart, with your lens…..I will have to read Julie’s poem…..I love Ms. Julie…..she is a unique and delightful person to befriend…… And my heart oozes with love for you too, Robyn! In the short time I have known you, I feel a connection and kindredness of spirit…..We are two old souls traveling our paths and striving for the light……we must have been acquainted in a past life somehow, if indeed those things be true……. Thanks Robyn….. This photo is fabulous. I love the sepia tones, the texture, and the layers of meaning. This is pure art Robyn. Will repeat myself once again. Postcards postcards postcards – or wall art – a must. Let me know once this is on a site – it invokes such peace and tranquility.